I didn’t know Anne Hathaway could sing. She also sacrifices her real hair for the Les Miz movie coming out in December. The timing is a bit off but maybe we’ll get a singalong to the Angry Men song. Can we send a deep dish pizza to the Chicago teachers? They appear to be going on strike. Oh, and Rahm Emannuel has continued to demonstrate his own particular brand of respect for working people, bullying and mean and nasssssty. I hope the Chicago teachers have been paying attention to the way he treated Occupy. The school system, which employs about 25,000 teachers, announced contingency plans in the event of a strike, including a program to open 144 of its 675 schools with half-days of activities supervised by people other than unionized teachers. Officials said that program would also include meals — no small concern since 84 percent of the city’s public school students qualify for the free and reduced meals program. WTF? 84% of Chicago’s public school children live at or below the poverty line and qualify for the subsidized school lunch program?? That’s fricking outrageous. What is Rahm Emanuel doing about that? Is he working with businesses and corporations in Chicago to make them pay a living wage? Jesus Christ on a Cracker, this is just beyond derelict. I realize that he’s only been mayor for a year but in that year, he seems to have spent more time suppressing the Peasants’ Revolts than actually working for them. Maybe he’s just following Obama’s example. As I recall, he sucked as a state rep for his little corner of Chicago. Well, now is the time for both men to show their quality. Time to step up and demand fair working wages for all of Chicago. At this point, the teachers of Chicago are subsidizing those lunches with their substantial taxes. It’s time for the wealthy to stop getting away with dumping all responsibility on the backs of the 99% who they are underpaying. What say you, Rahm? Be nice now. 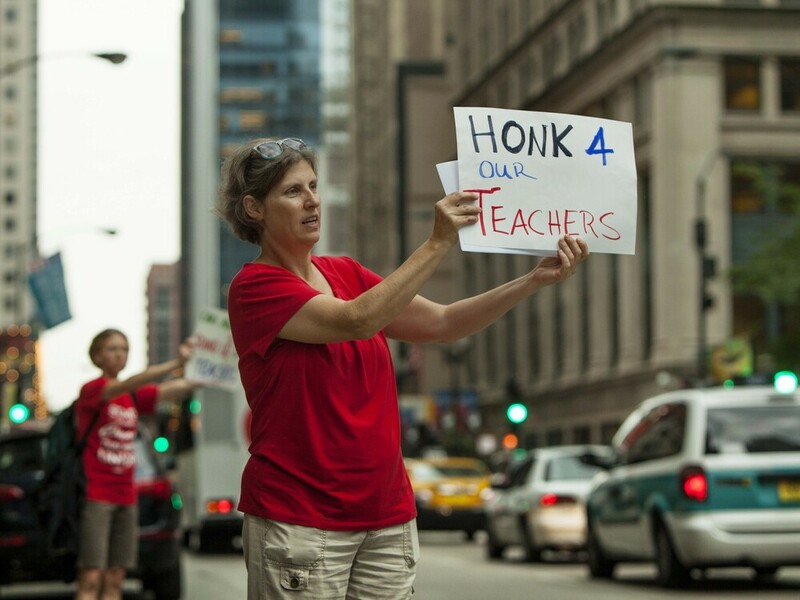 Here is a link to the Chicago Teachers’ Union. So far, they seem to have the support of working people in Chicago. Now, they just need to hang in there. I’m guessing they’re going to need more than pizzas to man the baricades and hold out longer than Rahm.